Everyone here knows that Sandusky, OH is one of my homes away from home. I love Sandusky, I love the work I do up there, and I enjoy the unique Great Lake Erie nature and views. I would be awesome if the rest of my work could be as enjoyable and fun, and everyone else's work could be this way too. But, there is a dark downside to Sandusky, the restaurant food has been really unhealthy, filled with fried trans-fats foods, and low on the list for fresh veggies. It has always seemed a bit odd that there were so many farms in this suburban/rural area, yet there were no restaurants that used the bounty grown in North Central Ohio. In the recent years, I have gotten around this problem by getting to know some local farmers and buying direct, knowing where the farmer's markets are each day of the week, picking my own to pay on an honor system basis, and microwave cooking local produce in my hotel room. I have dug deep into this area to find locally owned restaurants, among the vast number of chain fast food and fast casual places. I never thought that the Sandusky food scene would have a French inspired brasserie with items on the menu that uses locally grown organic veggies from small local farms. I can attest to the deliciousness of local organic foods grown in this area because I have eaten veggies fresh from local farms. I never thought it would be Sandusky where I would eat Pate de Campagne (country pate) for the 1st time since returning to the USA from France. Zinc Brasserie's Pate de Campagne was so good, and made in the Burgundy tradition, that I swear I was back in France eating pate. I never thought it would be Sandusky where I would feel completely transformed back to French dining in a small village brasserie. Folks, I am star struck for sure, and I am going to dining at Zinc Brasserie every time I am in Sandusky. I don't know where to begin! 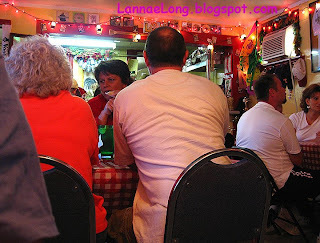 So much about this little restaurant is swirling in my head! This little place reminds me of one of the dining experiences we had in Givry, France. The color scheme of this bistro and bar were the same as our Givry experience. The charcuterie plate came out and it was artistically made as any starter meat plate in restaurants we ate in little towns in France. 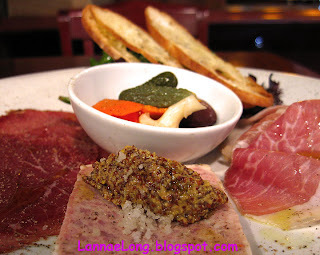 The house made air dried beef and the house made pork country pate woke my taste buds in a way that they thought they were in Pommard France. I followed up the starter plate with a spinach, apple and applewood bacon salad. The amazing thing about this salad is that I believe it is the 1st salad I have had in Sandusky over the course of 10 years that I actually had a green that was not iceburg lettuce. Other salads included local heirloom tomatoes and local roasted beets. I love roasted and boiled beets. I have never seen heirloom tomatoes or roasted fresh beets on any other menu in Sandusky. I am impressed already and I have only talked about 1 starter and my salad! Before I went on this trip to Sandusky, I did a quick peek at Trip Advisor restaurants, and Zinc Brasserie floated to the top as #1. In years past, the #1 restaurant of 54 in Sandusky was a chain, and a chain I don't want to frequent. I don't completely trust Trip Advisor's rankings because at one time, the Nashville Ranks had chains and closed restaurants listed in the top 25. Needless to say, I was skeptical and went to look at Zinc Brasserie's website. I looked and I was still skeptical when the website claimed raw oysters. I had flashbacks to a crappy restaurant claiming to have raw oysters, but no one knew what variety they were besides being fried or raw. I was SOOOO pleasantly surprised when I quickly stopped in Zinc Brasserie for lunch before I headed to the airport to come home. The deal is, the Chef and Owner Cesare Avallone is from the Sandusky area originally, went to CIA in NY and then worked at various chef owned restaurants in NYC and a few select cities in the USA. While in NYC he met his wife Andrea, who was born and breed NY, but is enjoying the pace of North Central Ohio. The clientel seems to be from the local area. Some patrons eat here weekly because it is so good. The price for starters, and salads are about the $8 - 10 range, and main entrees are about $18 - 28. When all said and done, the price point isn't that much more than chain sit-downs like Red Lobster, but the quality of the food, and the care of preparing the food is SOOOO much better than chains. The portion size here at Zinc Brasserie are generous for sure, and had I been heading back to my room instead of flying out, I would have saved 1/2 my meal for later. You can tell that Cesare really cares about every detail of the food preparation. It is the food preparation excellence that you rarely find anymore. The last thing I will say about this gem of a restaurant is that it is located in the heart of downtown Sandusky, where there is a bunch of free parking. I think all of downtown Sandusky is now free parking as an insentive to get more business and commerce to come back to this charming downtown. Sandusky, along with a lot of small hometown Americas have been dying due to the "Walmart effect", that is to say a lot of commerce has been taking out of the downtown to some edge of town strip mall or big box store area. Zinc Brasserie has only been open for a little over a year, but I have noticed that this one block of downtown has been much busier since opening. Zinc Brasserie will definitely help revitalize the Sandusky downtown area. I will certainly go to Zinc Brasserie again and again and help bring commerce back to downtown America. I just got off the plane from Ohio where there was plenty of gasoline (and about $0.35 cheaper than gas being sold in Nashville) on the next to the last day of restaurant week. We decided to go to Germantown Cafe because the advertised the the whole menu of entrees were available for choice in the $20.08 3 course event. We like Germantown for many reasons. Germantown's deal for the $20.08 special was 1st course salad or veggie beef soup, 2nd course a full list of entrees from fish, chicken, pasta, and meat, 3rd course was an option of 4 desserts. Germantown also offered other starts at an additional price like their signature savory sturdel, French onion soup, and other starters. This evening, I opted to have the French onion soup on top of my 3 course dinner of salad, spicy southern shrimp over white rice and spinach, and he got the flat iron steak over mashed potatoes and asparagus. I asked our rather "slacker" waiter about the desserts, and if there were any desserts nearing its demise, I want to know so I could pre-order it and hold it for my dessert. He mentioned that there were 4 desserts including cheese cake (I love cheese cake), and that he would get back to us about any getting close to being sold out. I was fairly clear with the "slacker" that I wanted the cheese cake, and I would order it up front if it is going to be 86ed. Well, the "slacker" never did get back, the cheese cake sold out before I could order it, and I was mad because I did not care for the other options that much. I am a little mad that I left the slacker slightly more than 15% because he DISSED ME. Anyone who knows me, I am usually a 20%+ tipper (for many reasons) and I have to feel really DISSED to go under that. I am still feeling burned by the slacker that I wish I only left 10%. The slacker waiter aside, we really like the entrees at Germantown. I feel like the entrees are staight forward, simple, and let the ingredients be what they are. The preparation and cooking are usually excellent. My French onion soup at an extra cost was delicious, and we both split it. The salad, I usually like because the kitchen usually tosses the salad, and has a light layer dressing on the lettuce leaves, but for some reason, this evening, they just dumped the dressing on top, so the top leaves had a ton of dressing (yuck) and the bottom had none. Not tossing a salad before serving, leaving me with a mouth full of dressing in some bites and none in another is a pet peeve of mine, and I don't enjoy the salad. For years now, I have enjoyed the salads here because they were excellently and consistently made by tossing with a very light coating of dressing on the salad. Had I known it was going to be the "slackers" way out by dumping dressing on top, I would have asked for dressing on the side. Our entrees, thank goodness, were excellent as usual. 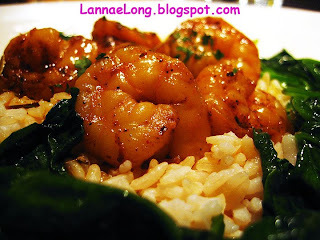 My shrimp dish was really peppery and spicy like I like, the spinach was freshly blanched, and the white rice was perfectly cooked to fluffy goodness. The flat iron steak was executed perfectly to his specifications of the rare side of medium rare. 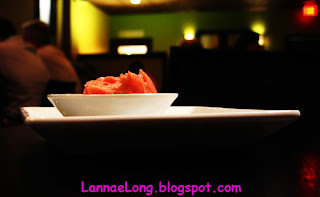 Germantown Cafe's mashed potatoes (either white or sweet potatoes) are always magical to my taste buds, and the mashed potatoes under the flat iron steak really were tasty. 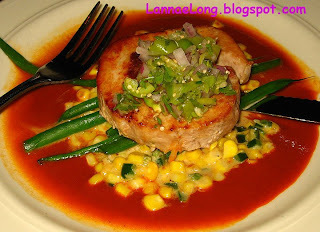 The entrees were what we were expecting, and we enjoyed our main dishes. It is disappointing that service was lacking by the slacking. It was disappointing to me that I did not get the cheese cake due to the slacking. The presentation of the salad and the gloppy dressing was disappointing at best. BUT, this meal was saved by the the consistent execution of the main entrees. Next time we dine at Germantown Cafe, we will not be going during the restaurant week, so I know now to just stick with entrees, don't even ask about desserts, and start asking for dressing on the side. We took advantage of Nashville Originals 1st Annual Restaurant week to try a couple of restaurants, like Yellow Porch. 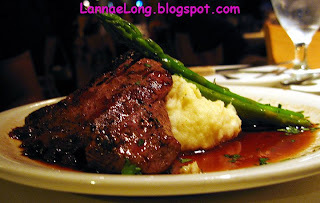 For some of the member restaurants (all independently owned), a 3 course dinner for $20.08 is a good deal. Yellow Porch seemed to be that place to try for only $20.08. For all the years that I have lived here, I have not gone there. I have always heard how expensive this place was, but the reality is that the Yellow Porch is about at market rate as any other restaurant in its caliber. It was a good choice because it is really close to where I live, so we did not spend more than a fraction of a gallon of gas to get here. Anyone reading this blog, for whatever it is worth, there is some strange deal going on here where there is NO gasoline at any gas stations, and the majority of gasstations are closed in Nashville right now. I have spent many days in Ohio, a state that had a lot of wind damage from the remnants of Hurricane Ike winds, and there was PLENTY of $3.65 for regular gas in and around Ohio from Cincinnati to Columbus to Cleveland. Others I know working in Kentucky, say there is plenty of gas and all the gas stations are open. What the F? Is there a conspiracy going on here for future price gouging? The service was good during this busy week, and our waiter was working really hard for us and the other tables he was serving. The interior of this restaurant is a converted house, so it felt really homey to me. There is a nice yellow porch out side for open air dining, but we opted to eat inside. I sat against the wall seating, and there were a ton of really fluffy pillow to make the sitting experience more appealing. I liked the pillows, and I propped up one to lean on, and I could have just laid my head down and napped in this little converted house of a restaurant. That is how comfortable I felt here. On the limited $20.08 menu for the 1st Annual Nashville Originals Restaurant Week at Yellow Porch was 1st course a simple salad. 2nd course penne pasta, paella or roasted pork loin. 3rd course was dessert. The Yellow Porch also offered select bottles of wine for $20.08 also, and that is a good deal ($5.02 per glass) of some decent wine they offer. We both opted for our main course of the roasted pork loin. The roasted pork was stuffed with house made sausage, served over poblano skillet corn, baby green beans, and Oaxacan red mole and tomatillo salsa. The pork loin was a little dried out because they had to bake the loin a long time to make sure the sausage was cooked through, but the sausage stuffing was really tasty for sure. The corn, well, I love corn, so it doesn't matter what kind of corn it is, I would eat it. Over all, I think the dish was good, but had too many components to it which made it hard to focus on any one part. 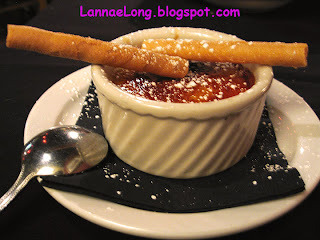 The dessert I opted for was the creme brulee, and it was quite tasty with a nice little crust on it. The Nashville Originals 1st Annual Restaurant Week did its job. I will probably go back to the Yellow Porch and try them out again with a full menu, rather than a limited $20.08 menu and see what they have to offer. My work in Harlan, Ky is winding down, so I don't get to get up there very often. Harlan, Ky isn't a big touristy area, and quite frankly, it is kind of a tough drive on windy mountainous coal roads to get there. It is funny what becomes a touristy area, and what does not. This area is a lovely mountainous area that has all the natural trappings of a desirable area to vacation, yet it never happened. Had the nation's political center ended up in southern VA, rather than northern VA, Harlan could have been the Greenbrier area. That all never happened, so Harlan became what it is today after many mine ownered closed down shop and moved their money out of the area. Harlan once had a vibrant economy on the backs of coal miners. Ford once owned his own coal mine in Harlan, Ky, and there was the Ford Mansion that sitting on a bluff overlooking his coal mine mountain. Ford used to truck the coal to his auto plants to fuel the energy needs to make the Ford cars. His house and mine are owned by others now. 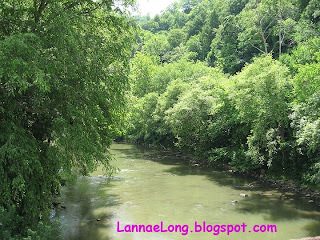 In Harlan, there are many tributaries to the Cumberland River, the river that creates the water front in Nashville, TN over 300 river miles downstream. The tributaries have cut deep gorges into the mountainous areas. 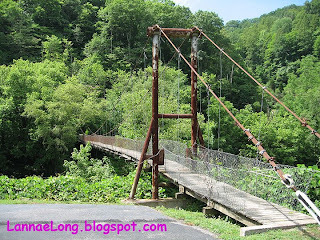 At one time, there were a number of swaying foot bridges to cross over the system of tributaries, and in some cases, these bridges were the only way to get from one side to the other. Today, all but one of these bridges have been replaced with a two-lane motor vehicle bridge. There is one last swaying food bridge left, it is not maintained anymore, and I have seen it in the distance for years now. As the years have gone on, the more scary it has become for me to cross over the bridge. I think the foot bridge is at least 7 stories above the shallow riverbed, so that idea even made crossing the bridge even more scary. Finally on the day, I decided to cross this bridge before heading back to Harlan for lunch. My co-worker, as we drove closer to the bridge was telling me "ghost stories" about the bridge to psych me out Boy, did he do a good job. He was saying that kids would sway the bridge and sway it so much that kids on the bridge would fall over. He said that there is no way to survive a fall from this bridge. He was willing to point out all the rocky areas in the creek bed right under the bridge. Oh, was I scared. But, when we got there, I did it. It was swaying with every step I took in the rotting wood floor boards. I walked across without holding onto the rusting suspension wires. Oh, getting to the other side was scary, but I went quickly to get it over with. Then I turned around, and saw how far away my co-work was from me. He was not about to cross the bridge, and he does not care for that experience. 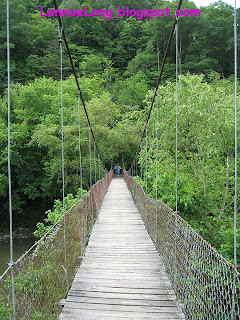 I took a deep breath, and walked across the bouncy and swaying bridge back to terra firma. I DID IT! Boy did I work up an appetite! My co-worker knew of a yummy locally owned burger and ice cream joint located at the south side of the town of Harlan. The Dairy Hut has recently been upgraded from a drive up window for Americana treats, to a sit in fast food restaurant. I was hungry at this point, so I got a big hamburger, cheesy curly fries and a soda. 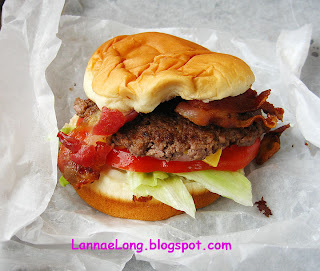 The burger was fresh ground beef that the Dairy Hut formed and cooked. It was not a pre-formed burger from a food distribution service. 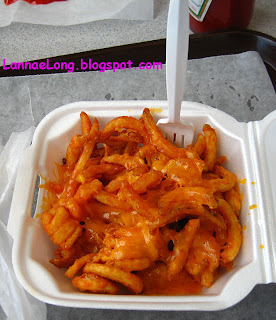 The cheesy curly fries were made from spiced curly fries with shredded cheese sprinkled on top, not some fake orange cheesy goop plopped on top. This day, the Dairy Hut was quite popular for lunch with all the picnic benches outside full, and all the boothes inside full. I can see why, I really liked the freshness of my Americana lunch. 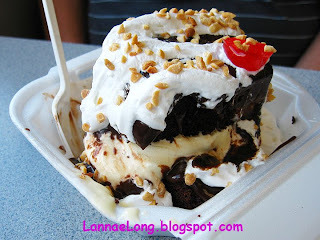 To finish off the lunch, my co-worker got a brownie sundae from the Dairy Hut. I mean, why go to the Dairy Hut without getting some of the signature ice cream treats. The sundae was way to high to be closed in on the small clam-shell take-away container, so he had to dig right in. He was more happy than a pig in slop. The sundae had 2 homemade brownies sandwiching a nice big scoop of vanilla ice cream, then topped with dreamy hot fudge, fresh whipped cream, nuts and a cherry. Mmmm, I am salivating just looking at the photo. If you find yourself in Harlan, Ky, and you want a burger and fries, skip the fast food chains, and head on down to the Dairy Hut. UPDATE: Closed. Too bad, there isn't a lot of dinner places downtown. I was in Tallahassee, FL for the 1st time last week for work. I was staying in the middle of downtown Tallahassee. I took the airport shuttle to the hotel, so I was going to be on foot for the week. The first things I noticed about Tallahassee was the humidity was really high like other cities on the gulf coast like Mobile, New Orleans, and Gulfport. I took a 1 1/2 hour walk around the hotel, about mile out in all directions, and noticed not one chain drug store, and not one chain restaurant within a 6 block area. I was not able to walk to most of the list of the top restaurants I saw on Trip Advisor because they are so far outside of downtown Tallahassee. It was really strange to not seen any walkable conveniences to where I was staying. My hotel is surrounding by many of the state capital buildings, courts and support offices. I wonder where those people eat, and run errands at lunch, as there really isn't much that is walkable and convenient. The working people must have big bags to carry all that they will need for the day. Luckily for me, there was one convenient dinner spot next to my hotel, and as of today, it is rated #1 on Trip Advisor for all dining in Tallahassee. The restaurant Urbane, I was told, has been open only about year. 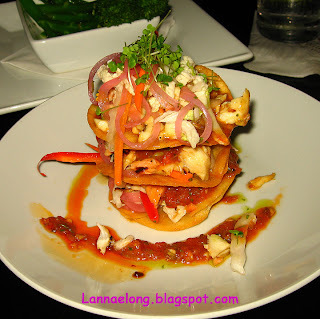 Small plates are about $10 and entree plates are about $25-35. The place is sleek, like you would find in South Beach. The clientele seems to be locals, who the owner liked to talk to. The food seems fresh. I asked about fresh squeezed orange juice, seeing that I was in a restaurant with a bar in Florida (home of the citrus) and they did not have fresh squeezed juice. When I asked the front desk at my hotel about Urbane, the young ladys said that Urbane was fancy, expensive and you have to dress up to go there. I will say that the cost at Urbane is slightly on the expensive side for Tallahassee, but as I saw it, the prices were about right for the dishes made. I did not have any dressy clothing with me, just polo shirts and basic black skirts I wear to work and shorts. I stopped on into Urbane right after a 1 hr jog, and asked to see a menu and about the appropriate attire. The hostess said what I had on was fine! Phew! I was able to go shower and change and wear a comfortable tee-shirt and shorts, and I was welcomed with big smiles. Before my meal came, the waiter gave me a tri-berry butter and a homemade little biscuit. I don't like biscuits because sometimes they are dry or taste like raw flour, or are too crumbly. But, I really liked this biscuit a lot! This little biscuit was really butter and moist, warm and baked all the way through and was no crumbly. It was the perfect biscuit. I should have asked for 2nds, it was so good. I opted for 3 small plates of arugula salad with grapefruit and avocado, a trio of fish tacos made with 3 fish and stacked on homemade flour tortillas, and broccolini. The salad was made with baby arugula and just tasted great with the citrus and avocado. The tacos had all the textures and base flavors to make this dish wonderful! The fish was soft and smooth, the tortillas were crunch, the homemade salsa had some heat, slight sweetness, sour and umami tomato quality to it. The onions and shredded veggies on the tacos added a nice aromaticness and crunch to the dish. The tacos are one of the best sellers, and I can taste way. It was a fine dish for sure. I was full, but not stuffed, so it was a the top end of the perfect amont of food for me. I left and went on my way to the hotel to get a good night sleep before heading out for the work I was sent to Tallahassee to do. 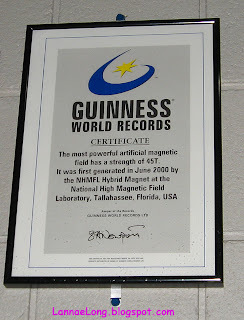 Part of what I was supposed to do in Tallahassee was to take a look at the Guinness World Record Holding most powerful electronic magnet in the WORLD! Yes, that is right the world's most powerful electronic magnet is located right here in the USA in Tallahassee at the Florida A&M University joint engineering college with Florida State University. 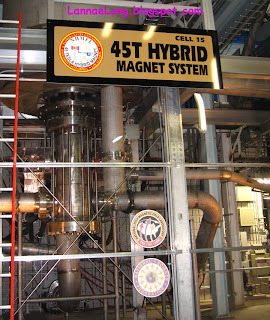 The world's leading electro-magnetic scientists, and leading electro-magnetic engineers all want to come to this place to run experiments with this magnet. It is so powerful, that it can reach over 45 Teslas of magnetic power. There is nothing like it in the world. Here is a little science for you: Nickel and cobalt are the metals that exhibit magnetic properties along with iron. So, if you are ever on Jeopary, and the category is science and the square says Nickel, Cobalt and Iron, you can ask the question, "What are metals that exhibit magnetic properties?" You can thank me, my blog and Florida A&M and FSU engineering college for that information that can get you a true daily double. The best pastrami I have ever had was at Katz Deli in New York. I have blogged about Katz Deli. I often think of Katz Deli pastrami. The layer of meat, the layer of fat, the layer of spices along with hand slicing of the brisket makes Katz Deli the best pastrami I have ever had. The 2nd best pastrami happens at my house, albeit only once per year because of the labor and time required to make it. I really love the flavor of our homemade pastrami. It is different from Katz's flavor and texture, but just as satisfying. I rarely get pastrami out in Nashville anymore because there just isn't good pastrami anywhere (except for Goldies in Sylvan Park and at times Noshville on Broadway). I don't expect Nashville pastrami to be as good as our pastrami, nor as good as Katz Deli, but I just would like a passable pastrami, so we don't have to make it. In the meantime, I am savoring the last little piece of our pastrami. mmmm good. 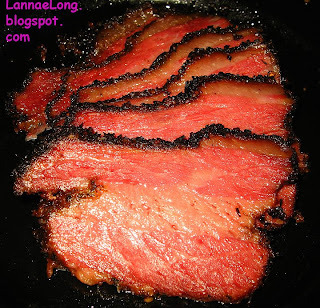 How to make pastrami is to get a flat cut brisket with all the fat attached. Corn the brisket with a solution of water, salt, sugar, bay leaves, garlic, pickling spices and saltpeter in the fridge for a few weeks. If you don't want to corn beef, get a corned beef flat cut from the grocery story with the most fat on top. Trim fat layer to about 1/4 inch high. 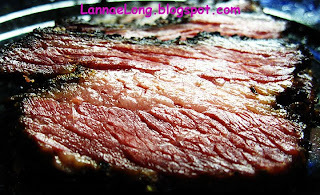 If you are using a store bought corned beef, take the corned beef, and soak it in water for 6 - 8 hrs in the fridge. Dry off the soaked corned beef. Pack a mixture of salt, half-sharp paprika, sugar, coarse ground coriander seed, coarse ground mustard seed, coarse ground pepper, and crushed garlic (or garlic powder) onto the corned beef. Let sit on a plate uncovered in the fridge for a day. Prepare smoker between 150-200 degrees F with hickory wood. Put spiced corned beef in a pan into the smoke chamber. Smoke for 6 - 8 hrs. Yesterday was my 1st full day back from a week long business trip, and I really wanted to catch up with stuff around the house and Nashville. Since I have been on the road so much this summer, I did not get to pick as many blueberries as I wanted. In a last gasp effort, I decided I wanted to go to my super secret blueberry patch and pick berries one last time, at the end of the season. After I was done with all my errands and "must-dos" in the morning and early afternoon, off we went to the super secret blueberry patch down in the middle of Williamson County. The blueberry season is usually over by Labor Day, and when we got to the patch, we did see a lot of purple berries, but the berries were mostly the Joe Pye weed growing up now. But, there were a few bushes still producing berries this late, and were offering big delicious and flavorful berries by the handful. We picked what we wanted, and decided to dine out nearby, sort of. We decided to give Papa Boudreaux's a try. Since we were already about 30 miles south of home, it would be just another 30 miles on fast roads to Papa Boudreaux's. Papa Boudreaux's is about 60 miles down the Natchez Trace from Nashville, TN and is located between Fly and Santa Fe, TN. We had a Google Map in hand, and off we went. Luckily Matt has bicycled around this area a couple times, and he knew where Fly Rd is. We took a lot of back roads, one that is a dirt road, to Papa Boudreaux's, and missed a few turns along the way because I just zoomed by some of the little roads because I didn't think they were the right ones. We recovered quickly though due to Matt's eagle eyes seeing the street signs. 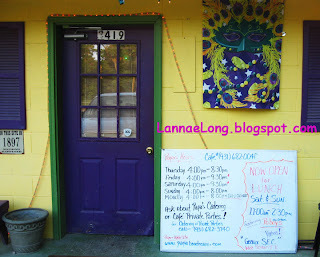 This place is definitely off the beaten path, and a GPS or excellent map is recommended. We finally find Fly Rd, a small windy country road, and I nearly zoom by this little 1000 sf house converted to Papa Boudreaux's. We got in just in time because there were 2 other parties behind us, and only one of the 7 tables open. 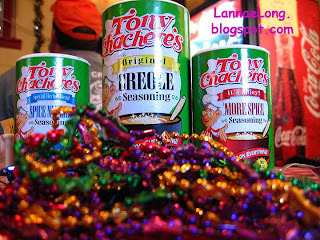 The table settings were simple, heavy plastic gingham table clothes topped with Mardi Gras beads, and creole seasonings instead of salt and pepper. The menu is just as simple with various combos of red beans and rice, etouffee, creole, fish and pasta as the mix and match base. 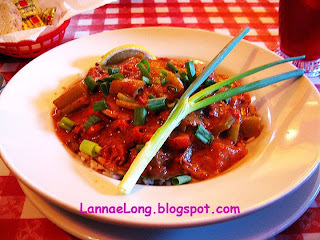 We opted for red beans and rice, and crawfish etouffee. The red beans was loaded with andouille and ham and red beans. 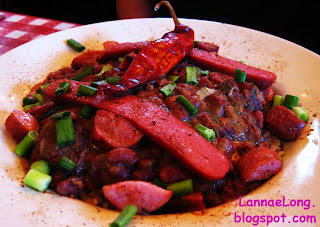 The red beans were stewed all day long with a definite click of red hot peppers. I opted for the crawfish etouffee. The gravy portion base ingredient is tomato with heavy cream. The dish was quite red from the tomato, had thyme and parsley in it, and and had a definitely butter fat layer of flavor to it. I originally thought it was a tomato based etouffee started with a butter roux, but the waitress (and most likely sous chef) said that the two top base ingredients are tomato and heavy cream. The dish did not look like it had heavy cream in it, but it definitely had the flavor of heavy cream. We were packed into this tiny little place like sardines. No one seemed to mind being in close quarters. The other 2 parties behind us had to wait in the gravel and dirt parking lot until a table opened up. Wait they did, despite no waiting room inside. We were served fast, and everyone seemed to play along with trying to be considerate of those who were waiting by not dilly-dallying after dining, and give those diners a chance to come on in. We did not dilly-dally, we dined happily, but paid quickly and left to open the scarce table real estate for the next diners. We quickly found Route 7, a major road that lead us to the Natchez Trace which we opted to take home. We entered the Trace, about 5 miles up on Route 7, and as we entered we saw a sign saying 50 miles to Nashville. We did not speed up the Trace because it was dusk and deer time. The fundamental deer rule is, for you city slickers, where there is 1 deer, there are more deer. You may see one deer on the side of the road running from you, but it is the 2nd or 3rd deer darting across the road to catch up with their buddy that will get in your way. The speed limit on the Trace is partially designed to keep car and driver at a safe speed to deal with the darting deer population. As we watched the 3rd set of deer dart across the road, we finally remembered that we had a hungry pet at home. So, no more dilly dally, and off we went home to feed the kitty. She was wondering where we were, but quickly forgot about that question as she munched on her dinner. UPDATE: Sadly, Shintomi has closed its doors. It has been rumored that one of the long time employees has been stealing thousands of dollars per year instead of paying the taxes, and drove this business into the ground. There really are not any good Chinese, Indian or Japanese restaurants in this town. There are only passable facsimiles, and only one that is more passable than the rest. Shintomi is the one Japanese restaurant in Nashville that seem to be better than the rest. Is it ever going to be Nobu, or Sushi Roku, nope. Will it ever be a Shoji, nope, but Shintomi is a nice and friendly little get-away in Green Hills that does a lot of things right. The sushi chef at Shintomi trims the fish well, so you have that smooth melt in your mouth feel. 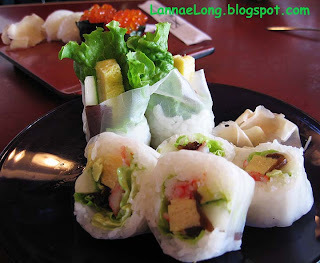 The sushi construction is of a Japanese tradition with manageable sized pieces of fish and rice balls. The rice balls here are packed just right, neat, a little airy but at the same time carrying structure for the piece of sushi. There is an art to making a good sushi rice ball. The food presentation here has more finesse and artistry that I associate with Japanese food, than any other Japanese restaurant in Nashville. You can judge for yourself by comparing Shintomi to others in this town. Shintomi is going to win hands down. So, on this day, I went to Shintomi with my Japanese American friend who always has one weekend lunch at Shintomi. My friend is a regular, and it was fun to be a part of the regular's table. 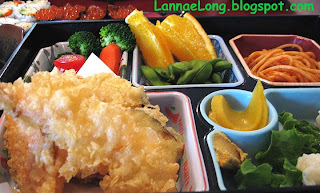 The Bento Box lunch is a great deal, less than $10 for a box containing a protein and a variety of other yummies in the box. The sushi may seem expensive compared to other places in town, but it is of better craftsmanship than the others and completely worth it. 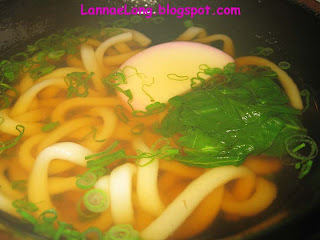 And I know that I could make udon at home for less than $1, but I always enjoy having a nice restaurant make for me a steaming hot bowl of udon that I did not have to make. It always seems to taste better at Shintomi than my house. 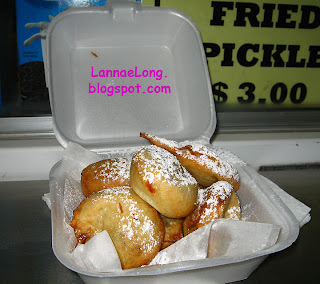 We always threaten to try a deep fried sugary snack every time we are at a fair or festival. This time we went through with it at the Wilson County Fair. 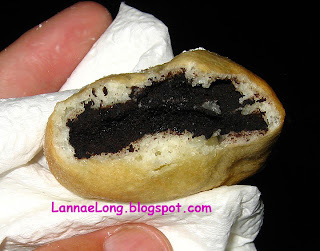 We looked at deep fried Twinkies, Snickers, and Oreos. We opted for the deep fried Oreos that are finished with a sprinkle of powdered sugar. We ordered, and the fellow took out 6 oreos and dipped them in what looked like pancake batter, then put them immediately into the vat of hot bubbling oil. We waited a few minutes, then he took the hot fried oreos and plopped them into our to-go box. We went to sit down and try these sugary and fatty treats. They were hot. They were burning our mouths. We waited for them too cool off a little and tried again. The inside was a bit melty from the melted cream layer that melted into the chocolate cookie layer. As we ate our second one each, we could feel the oleo levels rise in our veins and we started to get a sugar buzz. I am glad we tried these things, but I don't think we need to ever order these up ever again. I guess I am a purest when it comes to cookies. The next time I have an Oreo, it will be straight up, no frying, and opened up first to eat the cream layer first, then the chocolate cookies second. And maybe some milk or hot tea to wash down the classic treat.